When a human dies, it's customary to send flowers in memory of the deceased to the funeral home or close relatives. That's not usually done when a pet passes -- and few hold formal funerals for their animals -- but sending flowers to the bereaved pet owner or to the pet cemetery is a nice gesture. Consider whether you want to send real flowers, silk plants or a permanent flowering shrub. 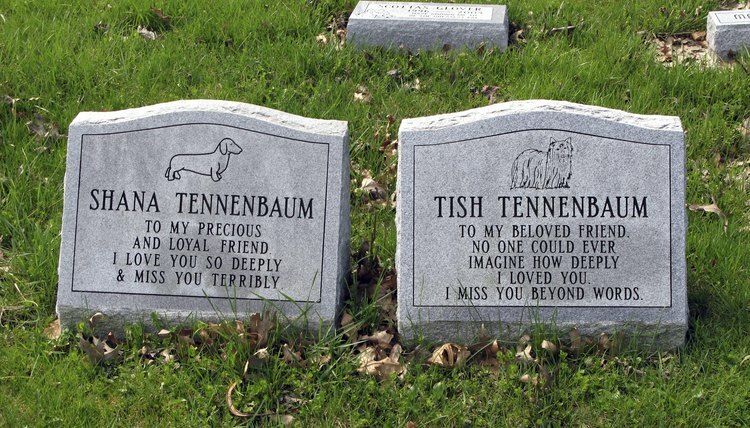 If the pet is buried at a pet cemetery, call the facility and ask about their flower policy. It's possible the cemetery can order flowers from a local florist for lawn burials or sells silk flowers to accompany urns. If cemetery regulations permit, consider giving the pet owner a rose bush or other flowering plant to place in the ground and accentuate the setting for the long term. Florists can put together bouquets representing the deceased pet, or place a photo among the flower arrangement. If the owner has purchased a coffin for the animal, ask the florist about putting together a pet-related spray to grace the casket.